Numerical Ability or Quantitative Aptitude Section is getting complex and convoluted every year. The questions asked in this section are calculative and very time-consuming. One needs to fight tooth and nail to get a desirable score in this section. Once dealt with proper strategy, speed, and accuracy, this section can get you the maximum marks in the examination. 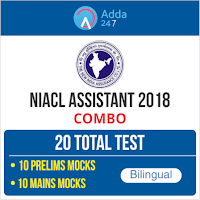 Following is the Quantitative Aptitude quiz to help you practice with the best of latest pattern questions for SBI PO and SBI Clerk Mains Exam. Not only this, these quizzes will also prove propitious for the upcoming Bank of Baroda Exam. Now, pull up your socks, it’s time for Blood, sweat and tears. 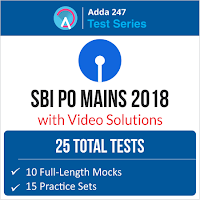 This quiz is according to the SBI PO/Clerk Study Mains Preparation Study Plan and with the help of this 25 Days Plan you’ll cover all important topics for Data Interpretation and Analysis section of Mains. Q1. If three taps are open together, a tank is filled in 10 h. One of the taps can fill in 5 h and another in 10 h. At what rate does the 3rd pipe work? Q2. Two pipes can fill a cistern in 14 hours and 16 hours respectively. The pipes are opened simultaneously and it is found that due to leakage in the bottom of the cistern, it takes 32 minutes extra for the cistern to be filled. When the cistern is full, in what time will the leak empty it? Q3. A tank of capacity 25 litres has an inlet and an outlet tap. If both are opened simultaneously, the tank is filled in 5 minutes. But if the outlet flow rate is doubled and taps opened the tank never gets filled up. Which of the following can be outlet flow rate in liters/min? Direction: Given below are 3 statements with the question, you have to decide that which of the following statement/statements are necessary to answer the question. Q5. Find the height of an equilateral triangle. A. Perimeter of the triangle is equal to the perimeter of the rectangle whose length and breadth are in the ratio of 5 :3. B. Perimeter of a square is known, which is twice the perimeter of the triangle. C. Area of the triangle is known. Directions (6-10): In the following number series only one number is wrong. Find out the wrong number. Direction (11-15): Given below is the data related to Candidates appeared and qualified in UPSEE 2018 entrance test from 6 different cities. Table also shows the ratio of boys to girls appeared and qualified. Q12. Find the ratio of boys appeared from city Gorakhpur and city Kanpur together to the girls qualified from the same city. Q13. Boys appeared from city Kanpur is what percent of average no. of Students appeared from all cities? Q14. If 100/9% of girls qualified from city Jhansi were found not eligible to take admission in the colleges due to some reasons. Then find the ratio between girls admitted in various colleges through UPSEE from Jhansi to the total number of students qualified from Jhansi. Q15. Find the total number of girls qualified from all cities together.